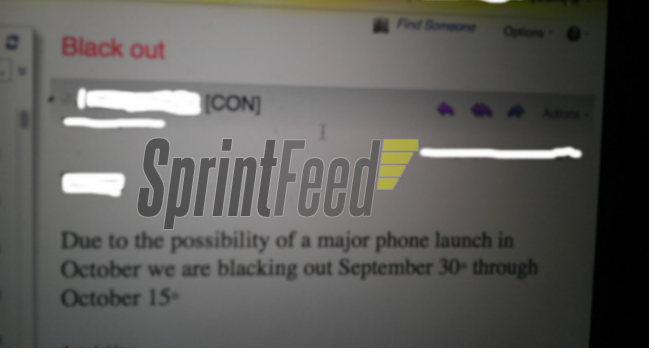 The leaked document, dug up by SprintFeed, mentions that the blackout extends from Sept. 30 to Oct. 15, though it neglects to mention the major phone by name. The timeframe surrounds an Oct. 7 "Strategy Update" presentation from the company that was announced late last month. A recent report from The Wall Street Journal said Sprint will launch Apple's next iPhone in mid-October. Responding directly to claim, the carrier issued an internal memo advising its employees not to discuss the possibility of a fifth-generation iPhone launch with inquiring customers. The carrier then announced plans to raise its contract early termination fee for advanced devices, including smartphones, to $350 starting Sept. 9. The new ETF, which would match AT&Ts and Verizons own cancellation fees for similar devices, is meant to prevent customers from ditching the carrier after acquiring new devices for subsidized prices. The move has been perceived by some as an indication that a Sprint iPhone launch is near. A subsequent report claimed Sprint cellular repeaters are being installed in and around Apple stores, further suggesting Sprint iPhone testing and pointing to the possibility of an imminent iPhone launch. On Monday, the company sued AT&T and its partners to block the proposed acquisition of T-Mobile. The wording of certain complaints made in the court filings has prompted further speculation that Sprint will soon begin selling the iPhone. Finally, on Friday, Sprint was rumored to continue offering unlimited data plans to its subscribers even after the expected iPhone 5 launch. Comparatively, the other two mobile operators that will carry the device, AT&T and Verizon, will offer tiered, capped data plans to their subscribers. Weighing in on reports suggesting Apple would partner with the nation's third-largest carrier to sell the iPhone, analysts estimated the carrier would sell 1.2 million iPhones in the fourth quarter of the year with Sprint iPhone sales growing up to 6 million in 2012. Apple is expected to announce the fifth-generation iPhone at an as yet unconfirmed media event this fall with iPhone 5 sales believed, according to some reports, to begin in early- to mid-October. The device is believed to sport the A5 processor found in the iPad 2 and an 8-megapixel camera, up from the current 5-megapixel shooter.